Sleeps 6. Two queen size and two twin beds. Master bedroom has recliner. TV set in every bedroom and living room. Full kitchen with all the amenities. Plates, pans, utensils, washer/dryer, Coffee maker, coffee, creamer, toaster and spices. Central Air conditioning and heating, cable TV and land line Telephone as well as Wi Fi. Double covered parking space right in front of town home. Front and rear private patios. Walking distance to El Con Shopping Mall and Randolph/Reid Park, Zoo. Very close to the University of Arizona. Three major bus stops within walking distance. Swimming Pool open all year. Linens and towels provided as well as soap, shampoo, conditioner, hair blow dryer. Please: Adults only, no smoking, no pets. Was exactly as advertised. Well equipped and comfortable and very clean. This was a terrific base to explore Tucson. Highly recommend. The property worked great for our purposes and we would rent again. Very comfortable, clean and "homey." Loved having cable in every room. We enjoyed our stay at this property. Xavier was attentive and responsive during the reservation, check-in and check out processes. The unit is very comfortable and we were thankful the AC worked! The kitchen is clean, the queen beds were comfy and the bathrooms were also nice. Favorite part... The sun light windows that let some natural light in the bathrooms and the dining area. Some of our party enjoyed the pool. It is very convenient and clean. I agree with others that the neighborhood is a bit sketchy, however, the complex was well secured. We felt safe AND I was thankful to be so close to the University. We came in town for our daughters graduation and stayed here for 3 nights. It was great!! The place was clean, nicely decorated, stocked with everything a hotel room would have but more and it was close to campus. It even had a pool outside our back gate which was perfect for the hot afternoons. Highly recommend!!! The condo is darling, well decorated, well supplied and very comfortable. We spent 2 weeks here in February to get out of the Midwest cold. We found the condo all ready for us with easy to follow entry instructions. It's very clean and comfortable, the kitchen is well supplied for cooking, and there are plenty of towels and pillows. Xavier is responsive, if there are questions. 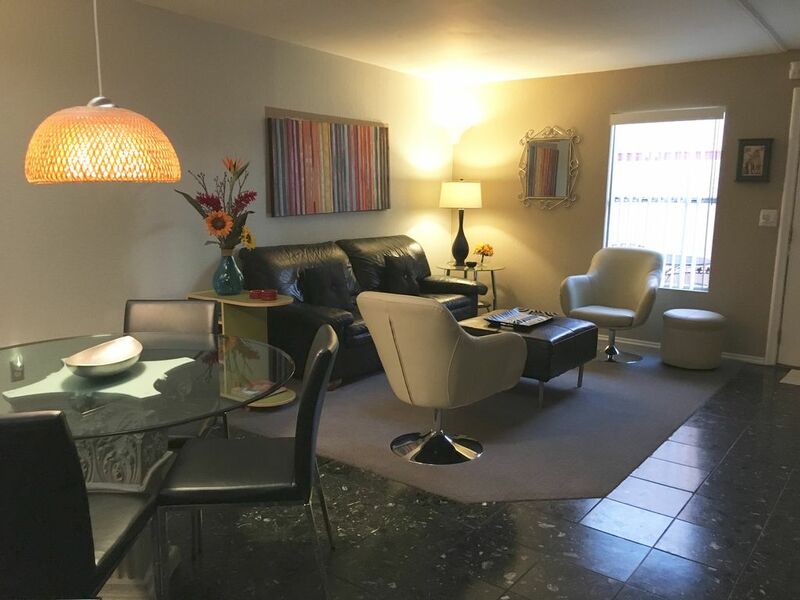 While the neighborhood looks a little sketchy, the complex is nicely maintained and the location is centrally located to everything you could want to do.